The Barlow Steam Car Company appears to have been know by several other names, including the Barlow Steam Engineering Company, the Barlow-Detroit, and the Barlow Steam Engineering Syndicate. In July, 1974, George S. Clark wrote to John Conde about the Barlow Steam Car. "Secondly, I have another picture which you might find interesting. This involves a long story how I found out about this car but I'll make it short. It came about from my interest in old stationary engines. A total stranger called up and said that he had heard of my interest in engines and that if I would help him bring a truck load of stuff donwn from Vermont and pay half the rental charge on the truck, he would give me the two engines that were up in Vermont also." "I told him I'd have to know a little bit more about them such as brand name, H.P. rating and, condition for I already had about 40 stationary engines. Then he said, "Oh, these aren't stationary gasoline engines, they are steam engines!" Well, the deal was made then adn there for me to help him." "The fellow's name is Ed Barlow and his father was Lester P. Barlow, and from what his son [Ed Barlow] told me about him, he must have been [a] revolutionary type of man. He held over 100 patents in all sorts of mechanical devices, anything from steam to air craft equipment. He had been one of the "Early Bird" pilots and had flown for Pancho Villa in the Mexican Revolution. Quite a past - Anyway, he built this Barlow-Detroit Steam Car in 1921 and this picture I'm sending is of a plaster of Paris Cast of his car which was supposed to have been used in sales promotion. This was up in the barn in Vermont along with the engines that I got. As far as I know there was only one car built." Isn't it amazing how you bump into history like this when you go off on Wild Goose Chases[?]. I don't claim that this was a production car but I thought you might find it interesting. His son had rolls & rolls of patent drawings of the car which of course, he kept. I hope to see you at Hershey - God Willing. Geo." George Clark's reference to an archival treasure in Vermont invites additional research. This is the Plaster of Paris Cast of the Barlow-Detroit Steam Car made in 1921 to market the car. This photo was presumably taken by George Clark. The car appears to have Westinghouse shock absorbers. John A. Conde Collection. 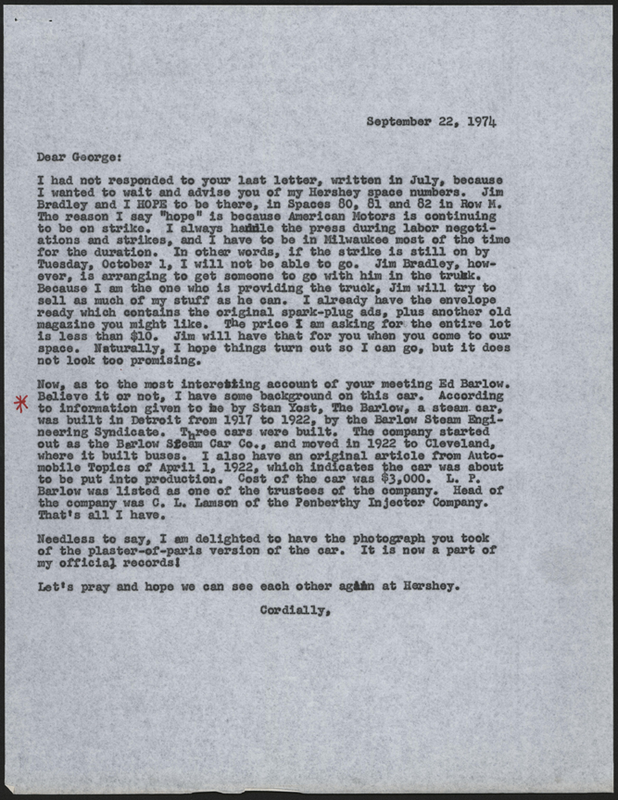 John Conde wrote to George Clark in September 1974 in response to Clarks July 1974 letter. There is nothing in Conde's file from Stan Yost. John A. Conde Collection. 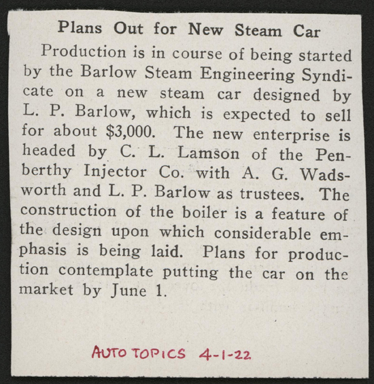 This short article appeared in Auto Topics in April 1922. L. P. Barlow is listed as a trustee, as is A. G. Wadsworth and C. L. Lamson of teh Penberthy Injector Company. John A. Conde Collection. 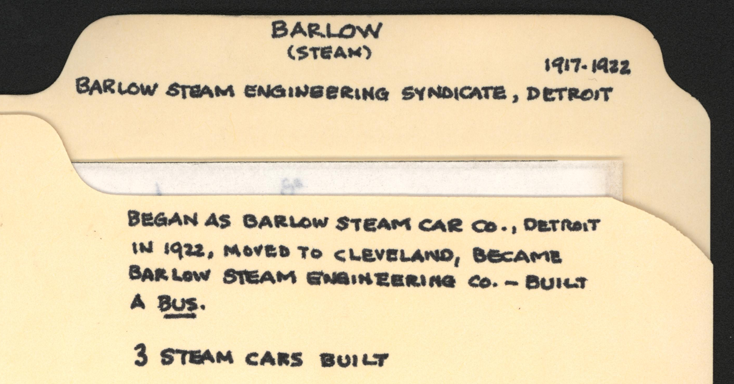 John Conde's file folder indicates that Barlow built three cars and a steam bus. There is no evidence in Conde's file to document these notes. John A. Conde Collection. Clark, George S. to Conde, John A., July 22, 1974. The John A. Conde Collection, Barlow Steam Car Company, Virtual Steam Car Museum, Inc., Dallas, TX. Conde, John A. to Clark, George S., September 22, 1974. The John A. Conde Collection, Barlow Steam Car Company, Virtual Steam Car Museum, Inc., Dallas, TX. Contact us if you have additional information about the Barlow Steam Car Company, or if you have questions.